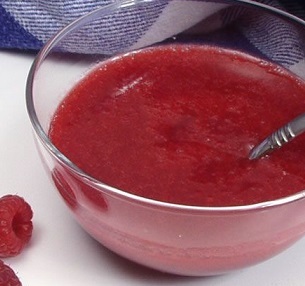 This Raspberry Sauce or Raspberry Coulis (a fruit or vegetable purée or thick sauce - coulis meaning 'strained') is delicious and easy to make. This sauce is the perfect complement to chocolate cake, cheesecake and many other desserts, but it also has many other uses. It is wonderful when drizzled over ice cream, ice cream sundaes, pancakes, waffles, French toast, shortcakes and poached fruit (especially pears). You can swirl it into yogurt, in or on top of sweet rolls, cookies, muffins and coffeecake. This sauce is also great with crepes, tarts and parfaits. 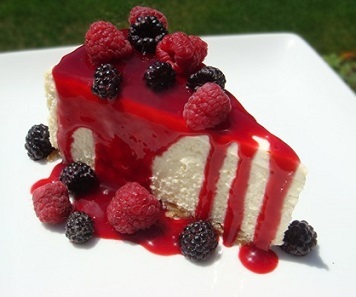 You can also use this recipe with blackberries and strawberries. 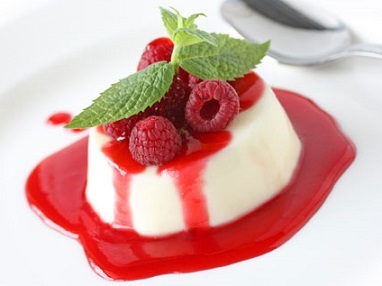 Enjoy your Sauce Recipe or Raspberry Coulis and the company of those you share it with! Did you know? Red raspberries are native to Europe and have been cultivated for over 400 years while wild red raspberries are native to North America.